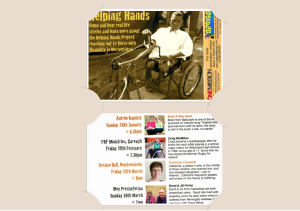 Helping Hands Event 28th Feb – Craig McMillan | . Last night Helping Hands had their second event highlighting the needs of those who live with disability. The key speaker was Craig McMillan who shared a message that spoke straight to everyone’s heart, because while very personal he reminded us of the underlying truth that each of us have our struggles throughout life. But throughout his testimony he was pointing us all to the One who walks beside us through it all, and has a bigger plan for the way He is shaping us to become more like him. Craig’s personal testimony somehow became a personal message tailored to each individual. Clearly God’s Spirit moving through what he had to share. I am very thankful to have been able to have been there and heard it. If I am wise I will take this message to heart and let it change me when I look back at my life or am tempted to feel inadequate. God has made us and shaped us for His own purpose and placed us where we are; to live, love and serve right where He wants us to be. Also it was encouraging and exciting to see people responding to the Kelly’s message with open and willing hearts to be used in whatever way they can to make a difference to those in need materially and spiritually. Sharon reminded everyone that you don’t have to be ‘young’ to go on a mission team; God looks at the heart and uses people who are willing to be used for His glory.